The sheets were just what I was Looking for after trying a few. They came neatly packaged in a soft cloth bag, not in plastics like others I’ve tried. I washed them as instructed and they came out super soft and fit my two guest beds wonderfully. My guests loved them. My only sorta complaint may be they are just slightly thinner then I’d like but for the price and feel that’s hardly worth mentioning. They arrived on time and are just what I needed. This beautifully tufted bed is from the Florence bedding collection. Its seafoam coloring makes this set easy to accessorize in your bedroom. The collection is made from 100-percent polyester polyoni and has pieced fabric sewn together to give this set added dimension. It is finished with a smooth edge of fabric that creates a beautiful border around this comforter. The color of the comforter is perfect. The comforter is soft, but is definitely too small for the size it is suppose to cover. I ordered a California King and it is probably about 6-7 inches to short on the width. I did end up keeping for a Queen size spare bedroom. Pretty and color is as represented! Did not like bolster or white pillows that cane with this set, just looked a bit 'unsophisticated'. Comforter is fine for Houston, Tx in AC or in our mild winters. So far no 'pilling' which has happened with other comforters…like the tufting. Very attractive. 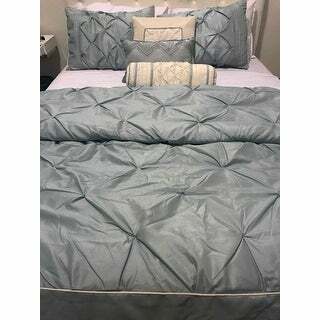 The color is beautiful and the comforter is of good quality. It looks great in my bedroom! I had searched for a new ensemble for over three years, nothing was suitable. When I saw this item I thought "how can this ensemble cost so little?" When I opened up the box I was taken back by the beautiful color (aqua) the shade was just perfect, upon putting it all together it was just perfect. The material is lovely, very rich looking, workmanship and stitching certainly five star and the fit perfect. The pillows are done very nicely and I am still in surprise as to how I could purchase, and Overstock could offer, this entire ensemble for so reasonable a price. My bedroom finally looks beautiful. Thank you. After a long time of searching, I decided to purchase this comforter set as I liked the style, and reviews seemed (mostly) positive. When it came, I was very disappointed with the quality. The stitching was horrific, but the worst part - it looked like beautiful fabric in the photo, but in reality it was that gross shiny polyester, and made the rest of the room look cheap. I really wanted to love this, but I didn't. I returned it, and ordered something from another store (much more expensive, but you get what you pay for in this case!). I really would not recommend buying this, especially if it is for a master or guest suite - tacky and cheaply made! Unfortunately this was the second and FINAL purchase I have made from Overstock. I just don't see the value or quality (even at the low price point). I purchased another comforter about a year ago and the same thing happened. I ESPECIALLY hate paying for a return when the item is faulty - not fair or reliable. Good bye Overstock. I love this comforter! The picture doesn’t do it justice. The seafoam color is exactly as I wanted and looks beautiful. I frequently purchase Madison Park because I am never disappointed with the quality. I would recommend this bed set. I LOVED this set when I took it out of its packaging. It was so beautiful. Well it came time that i needed to wash it. I have only washed it this one time mind you. I followed the tag. Its machine washable and you can put it in the dryer on a low setting. It says to use a large commercial washer and dryer. I went to a laundry mat. I washed and dried it. When i pulled out my blanket it was like it competely shrank. The filling was completely destroyed. Its a big lumpy mess. I thought if I took it home and messed with it it would get better. I played it on top of my bed and started. Lightly stretching it out. I cant get it back to the same size as it was. Lumps everywhere. Bald spots. Again this was after ONE wash and dry cycle. For the amount of money i had to pay for this set iam very ticked off of the quality. I have bought Wal-Mart brand bed sets that are by far better quality than this. I will never buy this set or anything from overstock ever again. Wonderful! I was absolutely beyond happy with this comforter set. I have been shopping for comforters online for years and they never looked like pictures because they made them seem with more volume. This comforter set is exactly as in pictures. Absolutely in love with it! I did buy it a little bigger than our bedside but that was our preference. SIMPLY GEORGOUS well made true color match my drapes perfectly. The pillows just BEAUTIFUL. THIS SET AWESOME IHAD TO WASH IT CAME OUT SO NICE I PURCHASE FOR THE HOLIDAYS GREAT PRICE BEST BUY EVER WILL BUY AGAIN IN A DIFFERENT COLOR LOVE IT ..
Haven't yet completed my new bedroom reno, but the colors are exactly what I'd been searching for and the elegant look is more than I expected. This 7-piece ensemble was a great deal for the price. Just hope it's durable enough to hold up to my "bull-in-a-china shop" husband and our small, short-haired cuddly dog. Very nice quality. I recommend. It came complete with beautifully simply designed accessories. Would recommend! My guest will love the luxury look! Simple but elegant ! "Do you offer a curtain that would match this Seafoam comforter?" Unfortunately no, there is not a specific curtain matching this. "Is the whites in the accent pillows pure white, off white or an ivory?" It's not pure white. It is more of an ivory. "appears aqua in pics. Is it aqua or blue? Thank you"
The color in the picture is true to the actual color of the bed spread. It is more of a greenish/blue (softer aqua) than a true blue. The color is the same as in the picture. It is a greenish blue. Beautiful and it matched everything in my bedroom.